This post is part of a series on artistic manhole covers around Japan. This is the manhole cover that started it all. For me, at least. I don’t really know which municipality in Japan actually had the first designed manhole cover, but this was the first time I ever really noticed the art beneath my feet. Obuse is a small town in Nagano Prefecture, nestled up against the mountains a short distance from Nagano City. Aside from supplying some pretty tasty apples to the surrounding markets, Obuse is most known for being the birthplace of Hokusai, one of Japan’s ukiyo-e masters. 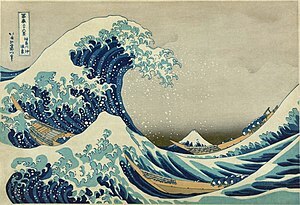 The Great Wave Off Kanagawa was part of Hokusai’s impressive Thirty-Six Views of Mt Fuji series. It catapulted him to fame, became one of the most recognized pieces of Japanese art worldwide, and made Obuse a place of pilgrimage for woodblock print admirers from around the globe. When a friend of mine retired I gave him a book of Hokusai’s pictures. Impressive! I have a new love and appreciation for woodblock art after visiting Kyoto!